The smartphones have brought the world literally on our fingers tips. Be it social media, emails, online shopping, utility bills payment, we see numerous tasks carried out using the phones. These smartphones can also be effectively used for the job search in Philippines. With the use of the mobile phones, you will never miss out on an urgent email or any notification just because you are not sitting in front of your computer. You can search for a new job opening in Philippines, navigate the apps, and also apply for the jobs using the mobile phones. The job search apps have made the entire job search process simple and effortless. Let us see how we can expedite the job search using our mobile phones. Mobile Apps – Install job search apps on your mobile phones. There are many job search apps available for iPhones, iPads and Android phones. The mobile apps help you search the jobs by keywords or location. They also email you the job listings, keep track of your contacts and even create your resume. The Job Portals –If you are looking for a job, create an account with the job portals like Jobaxy. All you have to do is to register there, by filling all your details and uploading your resume. Your details are saved in their database. This enables you to apply for the jobs from your phone as all your details are already with there. All you have to do is to click the ‘apply’ button. Look for Job Openings - Use your mobile apps to frequently check the new job listings. It takes just a few minutes from your phone to check the new job listing and it keeps you updated. Bookmark or Send Job Posts and Websites - With your phone you can bookmark the job opening you are interested or the website for a later visit. Also, using your phone you can copy to your home screen or print a copy of your listings from your phone. Another option is to mail yourself the job openings so that when you are using your computer you will have all the information. Get Notifications – Most of the job portals send you notification through text or email for the job relevant to your credentials. Opt for instant notification and apply for the job from your phone without wasting a single minute. Submission of Email Application – It is advisable to have your resume in your phone. This is because in case you get a notification about a job opening and you do not have your computer available, you can still apply from your phone. Forward your resume to the employer. Signature on Your Phone - Set up your signature on your phone. This will help you to communicate with the employers or the networking contacts without any hassles. Networking Tool – Your phone can be used for the networking. With the mobile networking apps, you can stay updated with your network, view and save the proposed jobs and also learn about the several companies. The Thank You Note - It is a good practice to send a thank-you note after your job interview. Using your phone, you can email the thank-you note to the employer immediately after your interview, no need to wait until you get back to your computer. 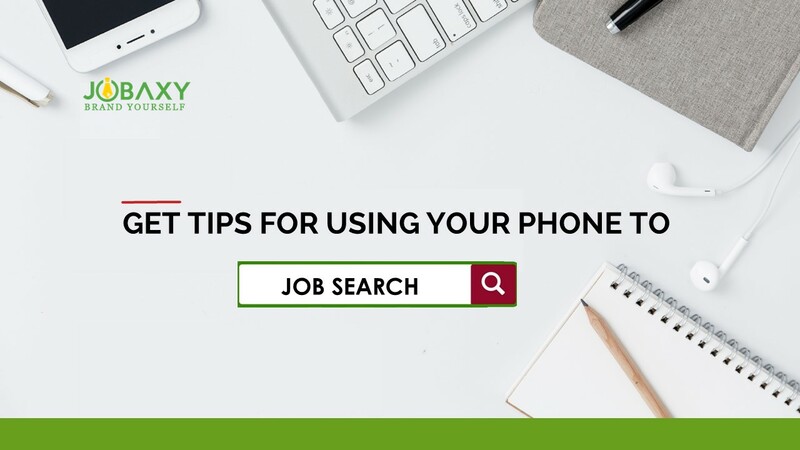 Listed above are a few tips to effectively use your phone in the job search. For more tips related to job search Philippines and job openings in Philippines, visit jobaxy.com. Jobaxy is the leading online job portal in the Philippines.